Located on the hills beetween Florence and Fiesole ; WiFi, Parking . The Villa is a portion of the Historical complex called Torre di Colonne dated from XI to XV Century, protected by the Italian Landmark Preservation Ministry. The Villa has been renovated in the last 4 years and consists of 2 double bedrooms, a living room with direct access to the wide and panoramic terrace, a comfortable and well equipped Kitchen, 2 bathrooms with shower. In the living is also available a sofabed for 2 added persons. The Villa is on 2 levels with few inside steps. Car is necessary, private parking available in the property. 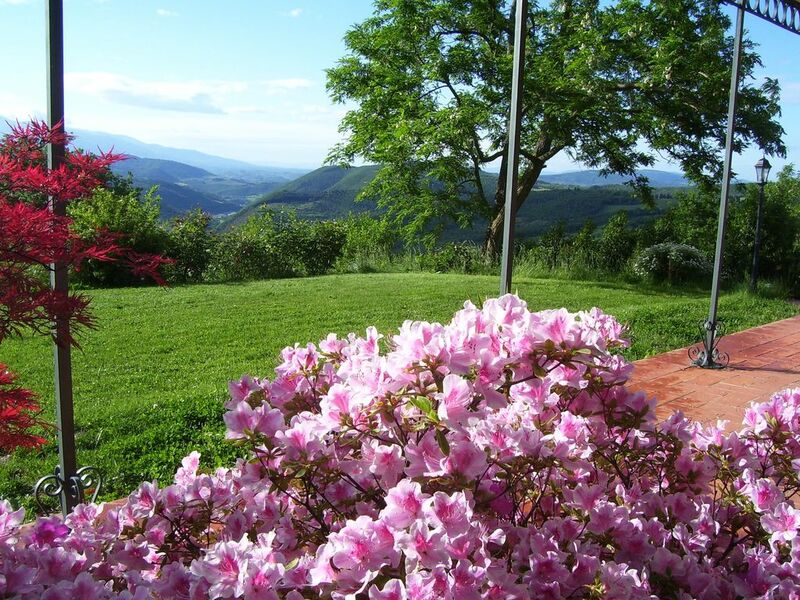 The Villa is strategically located to visit Florence, Fiesole and all the most well known destination in Tuscany and the amazing Chianti Rufina vineyards and the hills covered bt countless olive trees. From the porch you can enjoy a breezy weather in the summer while just few minutes from the summer heat of the city. There is central heater system and a typical wood burning stove to create a warm and cozy environment in the winter. The classic Italian decor makes the stay comfortable and you can enjoi and share the real local way of living.. I bougth this property with my husband Piero since we felt in love with this ancient house and its surroundings. The view, the stone house and the fresh air in summer. The Villa Torre di Colonne is sourrounded by a private garden, shared with the owner. A portion of this garden, in front of the Kitchen is private for Guest , as the wide panoramic upper Terrace. In your garden you will find garden table and chairs., Sun umbrella and longchairs A common laundry area is available in garage. fully equipped Private Parking area is available complimentary. Lovely villa, stunning scenery & a very kind owner. We thoroughly enjoyed our stay in this lovely, cosy & comfortable villa, there was ample room for 3 adults & everything we needed. The surrounding scenery is stunning, especially with the forests in their autumn colours. It was easy to walk from the villa onto the great footpath network, through the beautiful oak & chestnut forests. Whilst there was a little road noise, it certainly didn't spoil our stay in anyway. Its an ideal base for walking, visiting Florence & the surrounding area. The owner Alba was exceptionally kind to us & very helpful. We stayed for two weeks in September and were greeted by Alba on arrival who was very pleasant. The place was very clean and tidy and contained the basics in terms of foodstuffs when we arrived. The bedrooms were comfortable and the kitchen contained all that had been promised in terms of equipment – basic and compact but adequate for 2. There are wonderful views from the patio across the rolling hills. We spent a lot of our time out and about in the region and found the location very convenient for visiting Florence and the other main attractions. Some points we had difficulty with – this is not our idea of a “villa”- its more like a two bed apartment. We discovered that the structure seen in the photos is in fact divided into 3 apartments. The nearby house complex (with the tower) also houses 3 families. This results in the small car park containing over 6 vehicles at night and limited privacy due to designated “communal” areas. We found our part of the villa to be quite dark and gloomy and lights were needed at all times of the day. While Alba is an exceptionally hospitable lady she does not speak English – and relies on Google translate. There was little or no interaction with her and the other residents – probably because we were away a lot and also we speak very limited Italian. The house did not contain any “welcome manual” listing local restaurants, shops and the other usual suggestions re places to visit, important phone numbers in emergencies etc. etc. Our biggest negative was the road noise. When booking the property we asked then about proximity to the road but were reassured that it was “ a quiet country road with very little traffic”. In fact there is loud, continuous road noise 24/7. This is much worse during weekends and lengthy rush--hours/school-runs in the morning and evenings. Due to being on a steep hill there is the whine of constant racing engines and gear changes for cars, trucks and the extra loud, very numerous, motorbikes and scooters. To sleep we were forced to close windows which is not very desirable at 25 degrees. The noise and the smell of fumes made it unpleasant to sit on our wee patio in the evenings for a drink. We have experienced many holiday gites/cottages in other parts of Europe which were much better and for that reason we are able to give only limited endorsement. Thr Villa is about 1000 sqm and it is composed by 4 units including my house and yours. It is clearly written we live on the other side of the garden. This is a lovely holiday rental with fabulous views. Alba, her family and neighbours could not have been more helpful and accommodating. We were given copious amounts of delicious fresh and home-made produce on an almost daily basis and took up a kind invitation to watch the stunningly clear lunar eclipse with the neighbours. The house is scrupulously clean with screens on all doors and windows to minimise bugs inside. The road is a little noisy, but we felt that the advantage of not having to drive along unmade and pot-holed tracks for miles (as we have done in other properties) off-set this. Having two outside areas meant that we had a choice of sun or shade all day long and pleasant places to sit in the evening. If you choose to spend your holiday here I am sure you will find, as we did, that Alba and her family will make you very welcome and will strike the right balance between ensuring you are happy and respecting your privacy. Thank you Alba for your flexibility in accommodating our changing needs. We had a terrific holiday in a beautiful part of Italy. Beautiful countryside, owners friendly, BUT.... No one mentioned that there is a very busy and noisy road just outside and for the first 3 days and nights we were inundated with motorbikes going to a large rally. The villa was clean but tired and filled with second hand furniture. The plumbing was inadequate and both shower trays filled to overflowing with water when used and bubbled up with murky water when other people washed or showered elsewhere. We felt, having paid extra for cleaning, we might get clean linen or towels in ten nights, but no. As for the furniture: the house is not furnished with Ikea furniture but with family furniture, some antique, the sofa in the living room was purchased last year. I’m sorry they have not been your taste. Finally I take note of the problems you had with the bathroom and I will intervene immediately. I could have done it during your stay. Villa Torre di Colonne is in a very pretty position with easy access to Florence but in a quiet place. The property was very clean and comfortable, run by a lovely Italian lady, who was very helpful, recommending places to see and very good local restaurants. I would highly recommend this property. or on your Tomtom look for Pontassieve Strada Provinciale Molin del Piano (SP 84) we are at Km 10 . From North (Milano or Venice) A1 Motorway direction Firenze exit Barberino del Mugello and follow indication to San Piero a Sieci.Take the road SS2 called Faentina. When you reach the place Vetta alle Croci turn left and drive on the road SP84 to Santa Brigida - Molin del Piano. After 2 Kms ( milestone indicating KM 10) you will see the medieval complex Torre di Colonne. enter the white road and park the car. From South ( Naples or Rome ) Motorway A1 direction Firenze, exit Firenze Sud and follow the road without any turn. At the end of the road turn right on the road SS 67 - Aretina - direction Pontassieve ( no enter in Ellera stay on the main road). When you reach the village of Le Sieci turn left at the crosslight taking the SP 84 in direction Molin del Piano - Santa Brigidain direction OLMO. We are at Km 10 km. You will see on your right the medieval complex of Villa Torre di Colonne. Enter the white road where is the milestone 10 ....and park the cra at the parking lot. From Florence City Center: Piazza delle Cure, take via Faentina road direction Borgo San Lorenzo. Follow the road, in direction Olmo. Take the first on the right and pass the intersection following toward Molin del Piano- Santa Brigida. Follow the road SP 84 for the 2 Kms you will see on your left the tower of the villa , enter the white road where is the milestone indicating KM 10 . Take the white road and park the car. Nightly or weekly price include:accommodation, .Free WiFi and parking heating is payied on consumption, Euro 5 per cubic meter; cash on site Weekly or final stay cleaning Euro 40,00 for 2 Guests , Euro 50,00 up to 5 cash on site Montly stay means a full month.Weekly cleaning mandatory E 40 or 50, cash on site includes 3 hours cleaning and change of bedlinen and bath towels Monthly rate doesnt include utilities .They will be payed on consumption based at official price.